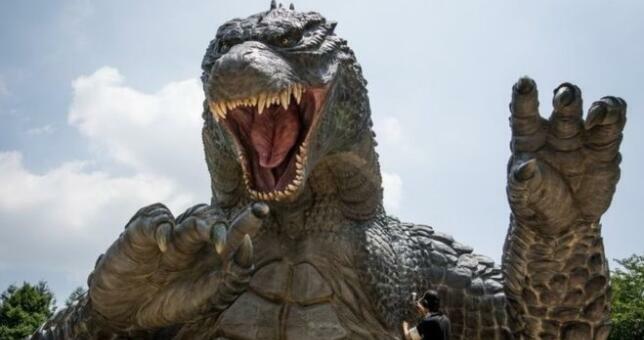 The man who first bought the beloved and feared monster Godzilla to life has died, the film company behind the monster says. Haruo Nakajima, who wore the Godzilla suit in 12 movies, died on Monday from pneumonia at the age of 88, it said. In an interview this year Nakajima explained how the original 1954 costume was created from ready-mixed concrete and weighed up to 100kg (220lbs). He said he studied animals in the Tokyo zoo to prepare for the role. Nakajima started off as a stunt actor in samurai and war films including "Seven Samurai" by Akira Kurosawa. He first played Godzilla - a giant beast who emerges from the deep after a nuclear test - in the 1954 film entitled Godzilla directed by Ishiro Honda and produced by the famed Japanese film studio Toho. He went on to play the character in consecutive sequels as well as playing other beasts Rodan, Mothra and King Kong. His last outing in the suit was in the 1972 Godzilla vs. Gigan. Godzilla has since become a monster classic with dozens of Japanese and Hollywood movies made featuring the character. Most of the newer movies use computer graphics to create the monster. The latest instalment called Shin Godzilla was released last year under the original Toho studio.